French artist JR’s photographic oversized street art often deals with human connections, preconceptions, prejudices, media portrayals, and other themes around community and identity. As part of the The New York Times’s Walking New York, he installed a 150-foot-tall image of Elmar Aliyev, a 20-year-old Brooklyn waiter who immigrated to the United States from Azerbaijan. 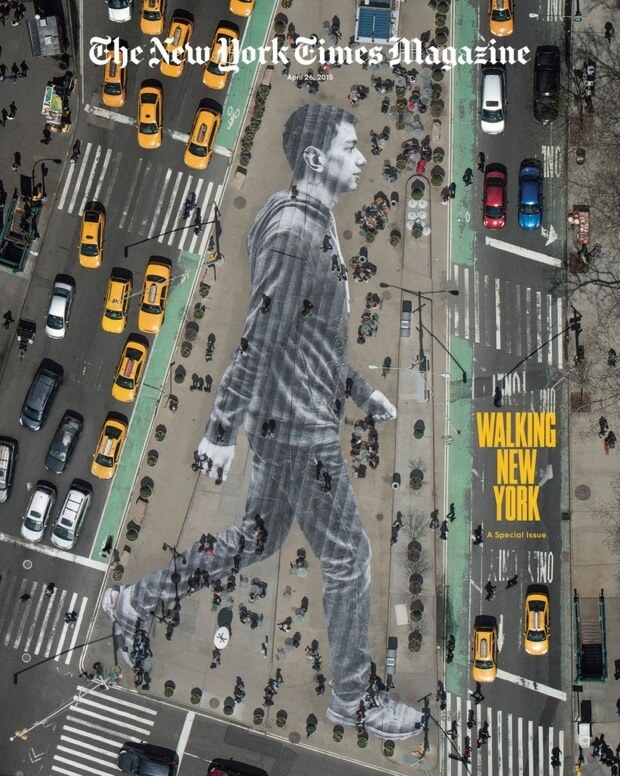 The giant piece is titled “A Walker in New York City” and is best viewed from the surrounding buildings, high above in a helicopter, or on the cover of The New York Times Magazine. You can see it assembled from 62 large strips of printed paper, pasted together by 20 people in 3.5 hours, in the installation time lapse video above. Watch this next: Here Comes the Neighborhood – The Wynwood Walls, Miami.